This entry was posted in Buildings, Community Service, Inclusion, JGL Birthplace, Juliette Gordon Low, Program and tagged #girlscouthistory, #girlscouts, #jglbirthplace, Girl Scouting, Girl Scouts, Girl Scouts of the USA, GSUSA, house museums, JGL Birthplace, Julie Nixon Eisenhower, Juliette Gordon Low. Bookmark the permalink. I understand what you are saying, but the point for me personally is that the Gordon family is deeply hurt by this and we are brushing off their years of goodwill without needing to. And it will only get worse if they change the garden. I also think the designation “holiest shrine” is ridiculous under the circumstances. This is the Gordon’s house, NOT where Juliette did her GS work. She just happened to be born there. She did her GS work at the Low House anyway, something the Birthplace staff always has glossed over when I’ve been there. Thanks for your support, Jayne! Hi Ann. As a family member of Juliette Gordon Low, I have no problem with the exhibit itself. I do strongly feel that it does not belong in the library of the house–there are other spaces available. There were decisions made–like hanging original Gordon family books, some of which belonged to Juliette–in an unprotected, artsy display above the fireplace–that we find both incompatible to a historic house museum and potentially damaging to the historic objects themselves. I’m glad to hear that girls are enjoying the exhibit, but I still think the modernization of the house is shortsighted. My family is glad that GSUSA has invited us to participate in a task force to review GSUSA’s cultural resources, including the Birthplace. All the best to you. Allow me to concur with my cousin Margaret. I have said for nearly two years that I have no problem with today’s technology being used at the Birthplace to benefit the Scouts. However, it needs to be available to the girls either in the basement (which lost its historic charm decades ago) or in an outbuilding (same loss of charm). I still weep over the loss of the once-lovely library. I’d like very much to see it restored and to see Mabel’s bedroom upstairs restored and reopened. The sight of magnificent old books haphazardly piled above the fireplace wrenches my heart. The writings on the walls, the track lights surrounding the lovely old chandelier….it is SO not Daisy! Allow the Scouts to tour the House and see its historic beauty as Daisy lived it, as my father lived it, as I, then my children, loved it. End their tours with the technology in its appropriate place: the basement or an outbuilding. Thanks. Dear Ann, your letter is well thought out. What or who lured you to visit and write such a detailed and picturesque blog after all these years? Did you not enjoy the birthplace before this latest redo? 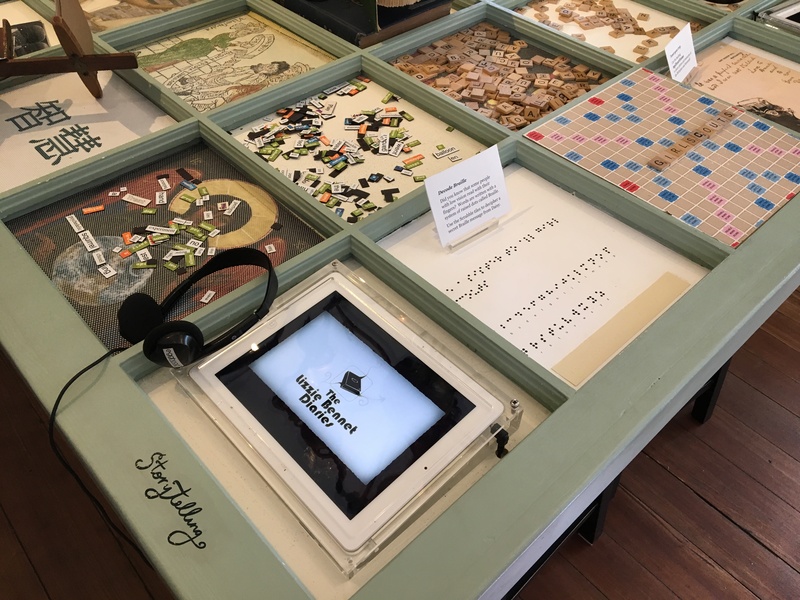 Did you ever consider that this technology and innovation could live well ALONGSIDE the first historic house museum of Savannah and therefore Girl Scouts could have it all; history and fun interactive technology too? How long did you spend at the birthplace outside of the hour with Cindi who was the mastermind of this project? Did you take a break from that nouveau methodology to see ALL of the alternative areas at the birthplace where this interaction could take place such as the two carriage houses? Did you ask why Mabel’s bedroom is closed upstairs and has also been dismantled and is now being used for mishap storage or why the foyer and dining room and other main living rooms have had nearly all of the historic contents removed and why basically the entire house has been emptied of the majority of its contents? Your detail and effort defend the current staff and not the history and legacy of the founder of your movement nor the children who need their history and movement to be held in tact. Our family is working together and alongside with GSUSA to find a way to support and encourage an uncompromised understanding and appreciation of history in modern times and we strongly believe that the need for an engaging interaction Is equally if not more valuable to the girls of today only if paired respectfully with the past… right next door in the carriage house. Please reconsider your shining down upon the current display by remembering all those at Girl Scouts who came before you and struggled donated and gave of their time and hearts and energy to create what was dismantled in a fortnight, then think about all the other spaces you mentioned and what the birthplace is to our Girl Scouts and how a reinvisioning could be easily put elsewhere and thus real actual history not destroyed in the process. The library can and should be restored to its beautiful place in time, because girls such as mine could feel what Juliette felt in that living room and dining room and all of the main house and they could live her story in their own imaginations, and then they could add their personal touch thru poetry or song or dance and find the technology of today and the future technology exhibits in one of the carriage houses or even the gift store as you mentioned. Do you keep family photos and letters and pieces or relics of your own history? This is what the birthplace has done for decades fornthe Girl Scouts and the main reason the birthplace has become significant. Why would you, a long time Girl Scout, be an advocate of erasing or “reimagining” your own history? Juliette was your founder, not Gloria Steinem or Oprah Winfrey. We will eventually want to go see Oprah’s house and how she lived. I wouldn’t go to Oprah’s house to see a book that Juliette wrote! They too have done amazing things but this is not their home. If Girl Scouts are struggling to stay relevant to its Girls, then they need to embrace and honor their past and its founder as those who’ve come before them who were the fabric that made Girl Scouts last 100 years until now. I fear that the current leaderships methodology in hiring people who openly claim that their teachings come from the actual “Anarchists Guide to History”, who are given authority to make such glaring errors and furthermore convince such long time devotees as yourself to not see the smoke and mirrors put before you. I encourage you to reconsider and take a stand to help us preserve and persevere together to find a solution to this dismantling and crisis at the core of girl scouting. Historians have been let go and in an effort to make Girl Scouts more colorful and all encompassing its own rich history is being whitewashed and hollowed out. God Bless Juliette as she rolls around in her grave hoping someone big up at GSUSA will take a stand and stop this modernization at the expense of its own core. Nina, thank you for your extensive comments. This was only my second visit to the Birthplace, so I do not have an extensive memory about the old library. Normally I only get to Savannah twice a year, dropping off and picking up my daughter from SCAD. I have been anxious to see the library in person because I have heard so much comment about it, but with the Birthplace closed on Sundays I had not been able to arrange it. I made a last-minute roundtrip from Washington to Savannah last Saturday–yes one day–to see my daughter’s latest play. With so little time in town, I asked Lisa if I could come to see the library. She agreed and we struck up a nice conversation. Cindi was not there. I would welcome the opportunity to see more of the house when I return to Savannah later this month, but there literally were not enough hours in my day on this particular visit. In my earlier comment I did not state that I work at a Living History site and deal regularly with donated items, scout groups and the restoration and preservation of historical objects. Many things need special care to be enjoyed by generations and I think the Birthplace need to know more about that than they do. Since that certainly colors my perception, I wanted to acknowledge that here. As a great-niece of Daisy’s, I doubt she’d be amused by the change in her family’s library. I do feel, however, that were she still with us, she would be the first to lead the way into the new world of technology so critical to today’s Scouts and the rest of us. 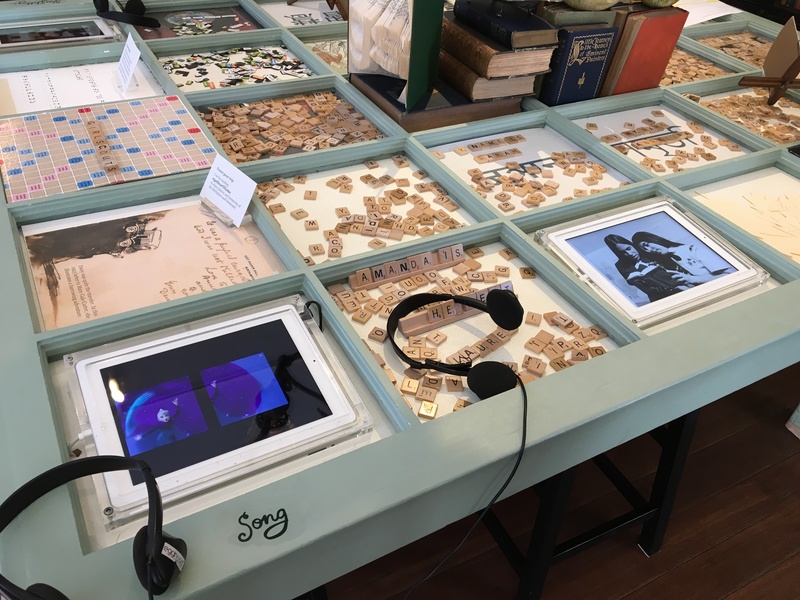 She would applaud the use of iPads and Scrabble tiles, but probably would move the exhibit to another venue like the old carriage house, so as not to interfere with the ambiance of the original library. But that’s just how I THINK she’d feel, especially after listening to my father tell stories about his childhood with her. What an incredible lady! 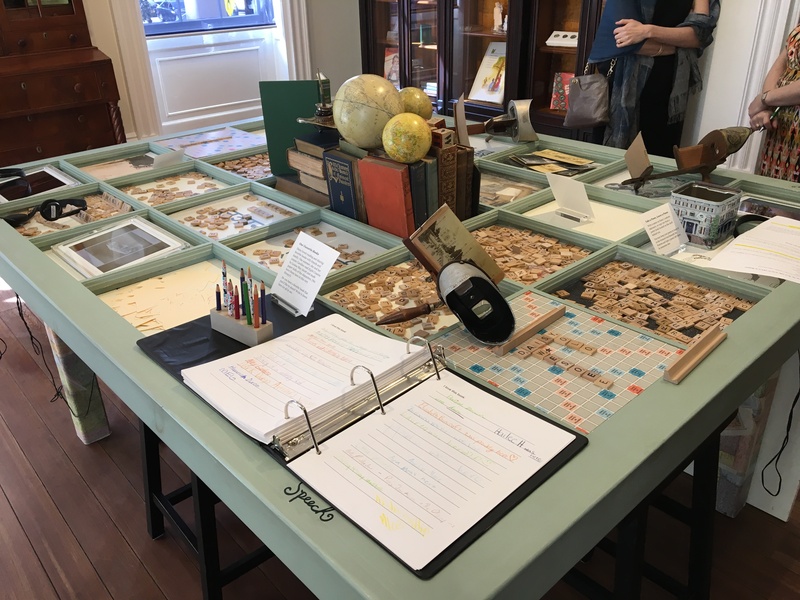 Thank you Ann for posting photos and insights on your visit with the Birthplace library renovation. As a lifetime member, historian by training and a former museum professional now working in a history and genealogy library, I had great concerns over the renovations of the Birthplace library. I like so many of the members of our movement have only visited the Birthplace once. Just a few years ago my adult daughter and I made the pilgrimage. While I appreciate the Gordon family’s concerns and comments, and still hold my own concerns for the appropriate treatment/archive/display of historic materials house wide, I also understand the need for a museum to connect with and build its audience. This glimpse into one aspect of the Library renovation and the interaction with girls was welcome concrete information. Ms. Johnson….I appreciate your input. But again…..The Gordon family is NOT averse to the use of technology at the Birthplace. We simply ask that it be moved to a more appropriate and equally accessible location. That’s it. That’s all we want. That’s it. Hi Ann. I hope you know (and your readers should know) that this is not just a family concern. There are many others who have expressed concern over changes at GSUSA. I am sorry not to be able to meet you in Savannah next week but you will enjoy meeting my cousins Leigh Ashman and Kinzie Gordon. It sounds like it will be a very interesting group involved in this review process. All the best. Margaret, thank you for your comments. Perhaps we’ll have the chance to get acquainted at the next meeting. As a senior officer at GSUSA, I welcome the thoughtful comments posted here. As we hold the convening of the Cultural Resources Taskforce next week in Savannah, we join a journey that Juliette started over a century ago. We enter with a wide tent of ideas, a rich cadre of thought leaders and a spirit of engagement. We will be sure to reject cynicism or its cousins – unhealthy skepticism and negativity. Every voice will be heard, and no space will be given for malignment of perspectives as we discover, ideate and gather data for decisions that GSUSA will ultimately make. And, oh yes, spirited debate is welcomed. We look forward…. Great to have the chance to meet you in person, Ann. Glad you could join us.